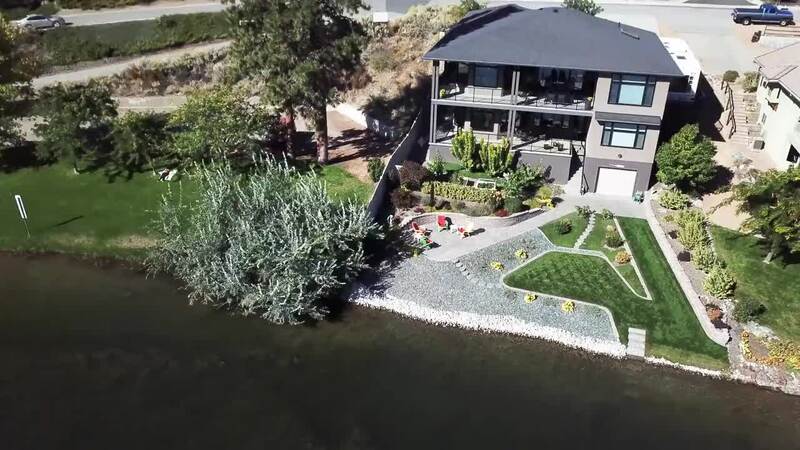 Located in the heart of "Wine Capital of Canada" - Oliver, nestled among highly recognized wineries in the Okanagan, this immaculately cared for home, w/ modern design features on quiet non-motorized Tuc El Nuit Lake - is GORGEOUS. Main floor w/open concept, presents eye pleasing lakeviews w/ rolling hills of the valley. Large kitchen with like-new SS appliances is a dream for any cook who likes to entertain. Downstairs has a large family room with lots of windows. Each bedroom has it's own ensuite. Spacious workshop on the lower level. Backyard is a DREAM where you can spend your days or evenings on your personal beach or paved patios. A wide assortment of mature plants, flowers. Boat house - YES, it has one, for all your toys. This backyard was specifically designed with outdoor living in mind. Minutes from Area 27 racetrack. Double garage to park your race car or a full-size pickup. Great RV parking. Be sure to view a promo VIDEO and the Virtual Tour of this elegant home. Sergej was born in Riga, Latvia. At the young age of 16, he ventured out on his own and moved to Canada with only $200 in his pocket. He later married a local girl from Saskatchewan and together they worked tirelessly to build and establish several successful businesses. Destined for new beginnings, Sergej and his wife, Laura, capitalized and sold two of their companies in 2012, planning to retire in the heart of the beautiful Okanagan (Penticton) at an early age of 34. Applying his "3-D" principles (Discipline/Desire/Dedication) along with his core values of integrity, accommodating the needs of his clients, and delivering “Above-and-Beyond” service, Sergej has been successful in all of his past business endeavors. Sergej has a strong background in house construction, metal fabrication, sales, and marketing. His fluency in English, Russian and Latvian has been supportive in his experience, allowing him to improve business relationships with foreign clients. Another one of Sergej's core values is to give back to the community, which led him to join a local volunteer Fire Department in 2013. He is very passionate about this and feels fortunate to be a part of such an elite group of people. The beautiful outdoors is one of the main reasons Sergej moved to the Okanagan with his family. In winter he enjoys carving through deep powder at Apex; in summer you may find him on the water, behind a boat, enjoying a 'skookum wake' while surfing with friends and family. Sergej Sinicin is a member of the Canadian Real Estate Association and subscribes to its strict Code of Ethics.